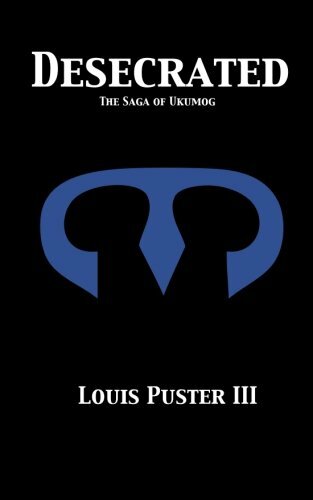 Desecrated, the 2nd book in The Saga of Ukumog, captured my interest instantly as author Louis Puster III focused on the immediate goal of the main characters within the first words. The tension that resonated at the end of book 1 between Wracked and Brin is a palpable as wood-smoke on a mountain breeze in the Prologue to book 2. The idea that there’s more to Wrack, the Tainted One travelling with Brin and Avar, than anyone ever realized kept me on that excitable edge throughout the novel. Each of the miss-matched group of travellers had their own agenda but ultimately their goal was cohesive – destroy The Doomed. The love-hate relationship between the warrior-maiden Brin and the more-or-less-than-human Wrack underscores the inner battle that each of the companions face internally. War is not just fought against the enemy and that struggle for self-awareness and acceptance translates into a believable multilayer struggle that propelled the story forward. My only disappointment came with feeling that I’d figured out Wrack’s secret too soon and the ending left me feeling un-satiated – I wanted and expected more from Wrack than the author gave. Desecrated is perhaps more revealing of Wrack’s companions in this installment of the Saga than Wrack himself. Without a doubt, I am entranced by the characters and their motivations and I’m compelled to read on to discover why certain decisions are made and others are not. The fantastic dystopian world Wrack, Brin, and Avar find themselves living in is truly a unique look at how the power of greed causes decay not only in the world around them but within the hearts of The Doomed and the main antagonist, The King. This physical representation of evil distorted and the natural order ransacked gives readers a bottoming-out feeling, challenging any microcosm of hope to find a toe-hold. Living with these characters as we see the good and evil in each of them and the constant shift in that balance echo the truth and reality of what anyone might face. I am most drawn to the idea that the Curse, placed upon this world that affected The Doomed in such a morbid way, was not necessarily the fault of the many but the few. I am eager to see this aspect of the story evolve as the Saga continues.